Location is amazing. Lots of supermarkets and restaurants. Metros and buses are ideal for exploring the city and arriving from the airport. The best location to see Montmatre and the Sacre-Coeur. Bus #30 is the best. In regards to the room there’s a fridge that’s great and the checking in and out is easy. The owner will provide you with the codes to access the front door and to get the keys. For the most part the owner responds accordingly. Convenient location: between 2 metro stations. One stop from Gare du Nord where RER B heads to/from CDG Airport. A few supermarkets nearby including Carrefour. 10 minutes walk to Sacre Coeur. 15 minutes on foot to Moulin Rouge. Washer+Dryer are big pluses. Good location, clean, nice decor. Close to grocery store. Well appointed kitchenette to fix meals. A block from Sacre-Coeur. This was centrally located to Sacre-Coeur and that is the purpose of my staying here. There are grocery stores, bars and restaurants in walking distance as is Sacre-Coeur. The room was clean and had adequate bedding and was well-equipped for a stay in the neighborhood. Essentially, close to everything that one might need. Good Wi-Fi and TV available. Refrigerator, stove, microwave and hot water pot and all cutlery, glass wear, plates, etc. That was nice. The host was very kind and was efficient and provided me assistance with my luggage. He also offered assistance to me for anything I needed. Good staff! Supermarkets near, Sacré Coeur too. The building is discret and just a square from metro. Good television, room well equiped, the shower is memorable. Great location and Florence was a lovely host. Room was particularly warm, but as the weather was so good it could not be avoided. Florence provided us with a fan to help keep comfortable. Location, access to metro, places to eat, 2 food stores within a block, 1 stop on metro to Gare du Nord to catch train to CDG airport, stores in area better bargains than anywhere in city, the apartment was fantastic (but we were out sightseeing most of the time). The most awesome bakery about 2 blocks up on opposite side of street...WOW! 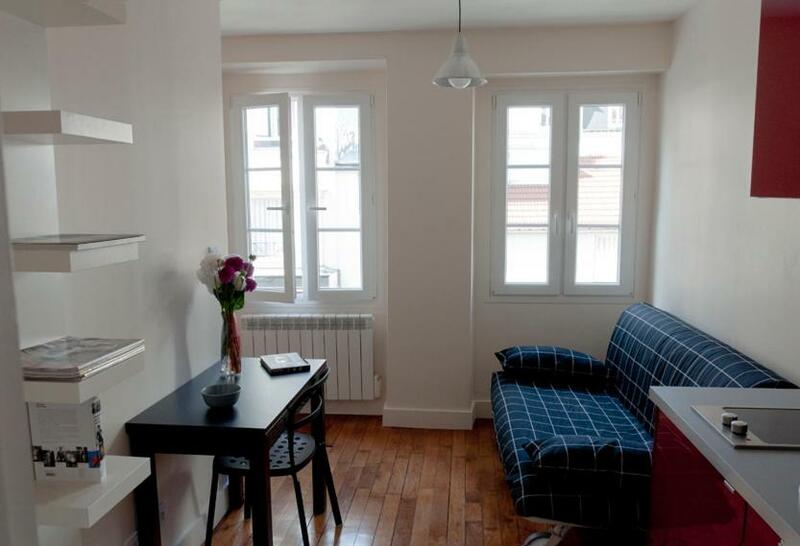 It's neat, near to Paris Nord station and like a centre place with easy access to everything. Clean. The place was small, but smartly furnished. Located 1,650 feet from La Butte de Montmartre, 1,950 feet from Basilique Sacré Coeur, Résidence Clignancourt is an elegant apartment which offers an LCD TV with satellite channels and free Wi-Fi access. It is 650 feet from Barbès-Rochechouart Metro Station which provides direct access to Les Halles Shopping Center and to Noter-Dame. When would you like to stay at Résidence Clignancourt? This studio features a kitchenette and a private bathroom. It is set on the top floor and features a sloping roof. 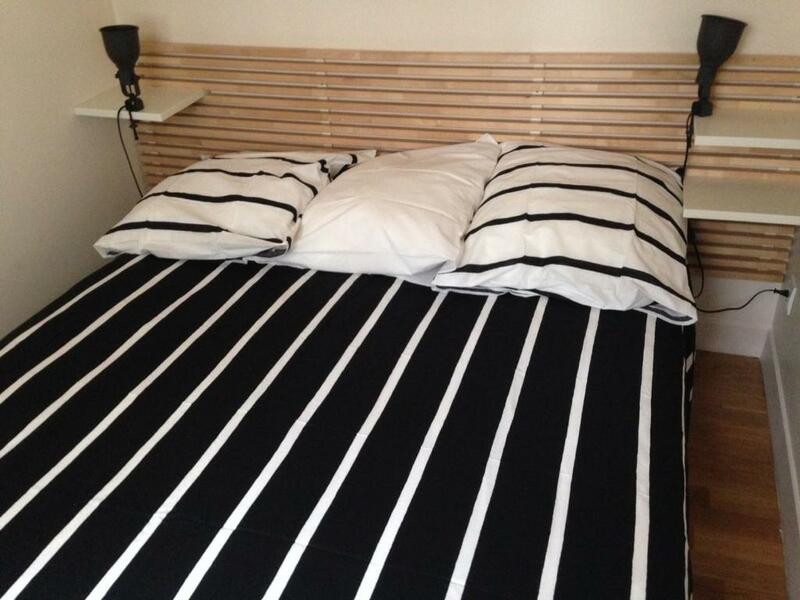 Nice establishment composed of 5 furnished and functional apartments. Easy access (bus at the bottom of the Residence and metro line 4 to 5 minutes walk, near Gare du Nord). Supermarkets, bakeries and restaurants nearby. I like to relate to my guests, share experiences I find it rewarding and exciting. I look forward to meeting you and welcoming as good as possible, so that you can feel at home. See you soon. The neighborhood is lively and multicultural. Walking distance to the Butte Montmartre and the Sacré Coeur. You will find typical Parisian cafés and restaurants around. Area Info – This neighborhood is a great choice for travelers interested in monuments, city walks and sightseeing – Check location Good location – show map Guests loved walking around the neighborhood! House Rules Résidence Clignancourt takes special requests – add in the next step! Free! One child under 2 years is charged EUR 0 per night when using existing beds. Résidence Clignancourt accepts these cards and reserves the right to temporarily hold an amount prior to arrival. Please note that late check-in from 19:00 to 22:00 costs EUR 50. Owner contact number given on booking confirmation page is wrong. No response on the contact number of given on confirmation page. Owner could not be contacted on reaching the property (late night with family). To our luck, nearby hotel staff had owner's correct contact number and we managed to get the codes to enter the property. They don't have a reception as such and no security checks. Anyone who knows the code can enter. I feel it's kinda risky... The contact number on the booking confirmation is never attended! We had to wait for an hour to contact them and get code to enter and the details of the room. We called them after check-out. Felt there's no check on who is coming and going! Very small room (attic), it was crowded. Partly, it was our fault (we only registered two adults, instead of two adults and one child) and the host was unable to change the room. The bathroom is basic and crowded (modern shower though). Close to bus/metro stations. Very close to Sacre Coeur. The host is responsive and helpful. In the kitchen there is no exsource fan. When you cooked smell food inside. Well, its near the supermarket and to Transportations. The place should be closed down. Kitchen could be slightly better stocked with supplies and equipment. Great location and neighbourhood. Prompt replies to all the questions about the property, Coralie made it very easy to manage. I stayed for 7 days and hardly any complaints. Highly recommended by me. There's a lot of humidity in the studio. Even leaving the windows open the walls were wet at all times. Really not good if you have asthma. There's lots of shops near by. The underground is just 1 block away and the main train station is 5 min walk. breakfast not included and also the price was too high for a small flat. Rooms and bathroom are too congested. There is no much space in the rooms. We faced difficulty to keep our luggage. Bathroom shower is flat and water spills over. I traveled with my parents. The location is good. Supermarket is just below. Bus and metro stops are close by. Kitchen is nicely equipped. The apartment is TINY literally and the facilities are limited. There were no clean blankets, no broom, no iron and the hygiene of the linens we had were subpar. The TV signal worked when it wanted too and we were only able to see TV in French. Other TV’s have the ability to change the language and settings, this one was blocked. Could not access unit when arrived.no info given prior to arrival. Unit was small, tv channels did not work. Had to find cash to pay for unit as their card reader did not work. Unit was above chicken food cafe.smells of cooking. No blinds on windows. No lift: quite troublesome for those with heavy/big luggage. The bathroom + WC is very small. The shower curtain can’t keep the water from spilling over.